I acquired this stove directly from Coleman in exchange for banner ads in covering the Coleman Weekend Adventure at Lake Caliraya last May 2008. After a little over a year of use using only Coleman fuel, I have a pretty good idea about this gear. 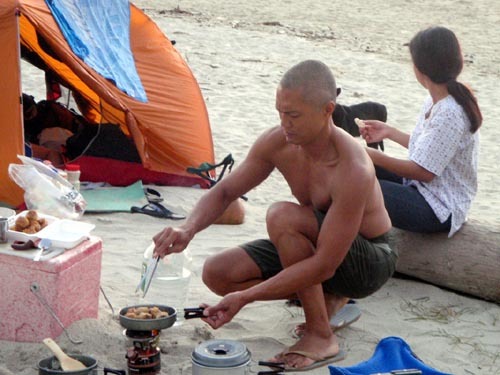 Coleman has been synonymous with family outdoor camping. The Exponent series is Coleman's attempt to penetrate the more aggressive market - mountaineers, hikers and outdoor junkies. simmer mode that works. Great for cooking rice because you need to simmer when the water boils. attachment to the screw-on fuel cap. It keeps the fuel cap from getting lost or misplaced. The fold out legs are not wide enough (given the stove's tall profile) to provide stability on top-heavy cooking. The pot support isn't wide enough. It's hard to center a wide cookset. Also, support is mainly in the middle and does not extend to the outer edge of a wide cookset. 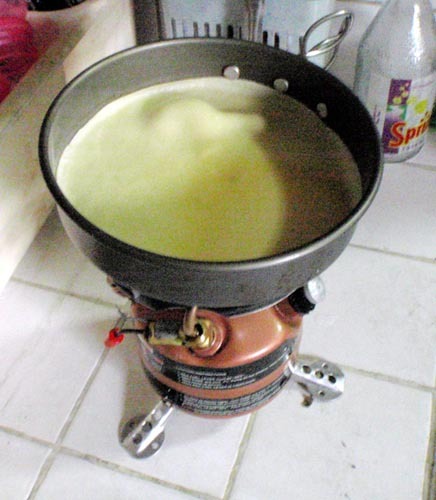 generator tube is raised higher than the cookset-support, making the cookset tilt either way. I find this to be the most troubling. While the burner bowl is useful for low winds, how about including an aluminum wrap-around wind jammer just in case the wind gets unmanageable? (July 18, 2009)The issues I have are more about its design than its performance. 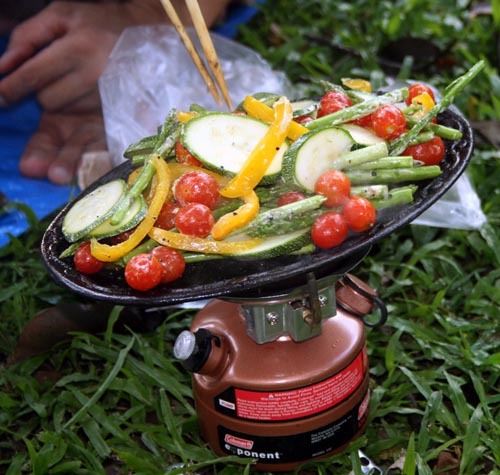 Stability is questionable given its tall profile, small-diameter cookset-support and small-diameter fold out legs. If I were to use a big cookset with lots of liquid, making it really top-heavy, I would support the stove itself with pegs and then add additional long pegs as guide for centering the cookset. This stove is ideal for a solo or 2-person cookset. Performance-wise, this stove performed the way it was designed for - it cooks flawlessy even at simmer mode. Reliability is also up there. This unit hasn't failed yet. 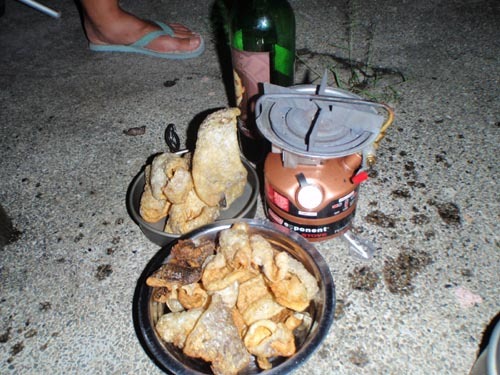 When I bring this unit anywhere (beach, mountain top, a picnic or even just at home), confidence is high that it will cook the food on demand. (Jul 21, 2009) thx for the helpful post. I have coleman multifuel stove. Which one is the best fuel in the absence of coleman fuel? How to clean the stove after use? I would suggest you use the Coleman camp fuel. Lighter fluid is not as clean as hoped, even unleaded gasoline (you'll get clogged generators because of the residue from the fuel). Always clean it after use. The material they use for the newer models of the stove easily corrodes. 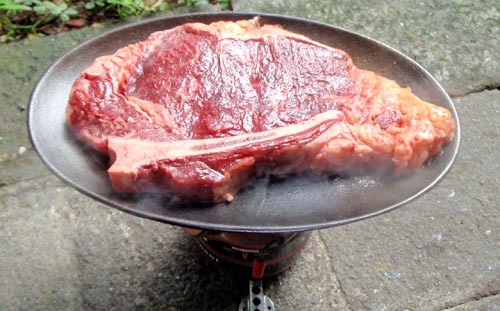 If you're cooking for a large group using a big pot, do not rely on the grate to hold your pot (the stand will eventually give out). use appropriately-sized stones or a metal grill to hold large/heavy cooksets. DO NOT USE DENATURED ALCOHOL. Someone did in my old stove and ruined it beyond repair.